Rossell, Josep M.; Rodellar, J.; Palacios-Quiñonero, F.; Rubió-Massegú, J. In this paper, some control strategies to design decentralized controllers are developed and discussed. These strategies are based on the Inclusion Principle, a very useful mathematical framework to obtain decentralized controllers, mainly when the systems are composed by overlapped subsystems sharing common parts. A ve-story building model serves as example to show the advantages provided by this approach. Numerical simulations are conducted to assess the performance of the proposed control laws with positive results. In this paper, some control strategies to design decentralized controllers are developed and discussed. These strategies are based on the Inclusion Principle, a very useful mathematical framework to obtain decentralized controllers, mainly when the systems are composed by overlapped subsystems sharing common parts. A five-story building model serves as example to show the advantages provided by this approach. Numerical simulations are conducted to assess the performance of the proposed control laws with positive results. 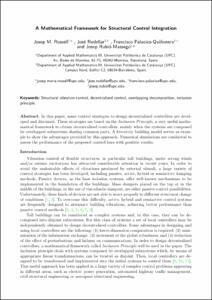 Rossell, Josep M. [et al.]. A mathematical framework for structural control integration. A: International Conference Smart Materials, Structures and Systems. "4th International Conference Smart Materials, Structures and Systems". Montecatini: Trans Tech Publications, 2012, p. 49-58.